The word synecdoche is a very strange and uncommon word that seems to be popping up for me everywhere. Most recently in a talk where the speaker seemed almost embarrassed to use (or even know?) the word. As best I can tell, it is a way of using a simple word to describe a bigger concept or thing. The other recent place where the word appeared was in a really great article by Oliver Reichenstein called Can Experience be Designed? This is a particularly enjoyable example of the navel-gazing self-justification essay that seems to pop-up with great regularity. He does not spare many punches in his critique of people who claim to be designers but have no substance to back it up. He suggests that the only legitimate understanding of the title ‘User Experience Designer’ is as a synecdoche. In other words, we do not presume to believe that we can actually design someone’s subjective experience, but we do understand that what we do does not begin and end with the placement of the pixels on the screen, or as he puts it “the visual design is a representative part of a much more complex construct”. The other big trend that I hear a lot is to remind people in my field that the work they are doing is not really all that new. In fact many of the core problems have already been well discussed and articulated by the architects and industrial designers of the 20th Century. 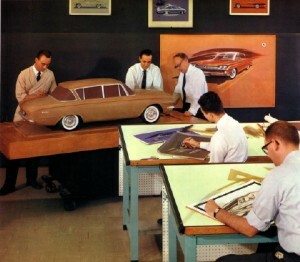 In fact it was just a couple of days ago that I was reading on the Autodesk blog that we should all “get more familiar with Nelson, Goffman, and Dewey.” So as a little ‘tip of the hat’ to those last-century industrial designers, I have included this awesome image of car designers in the 1960′ (although I suppose I should have chosen a Herman Miller image to pay George Nelson his due).